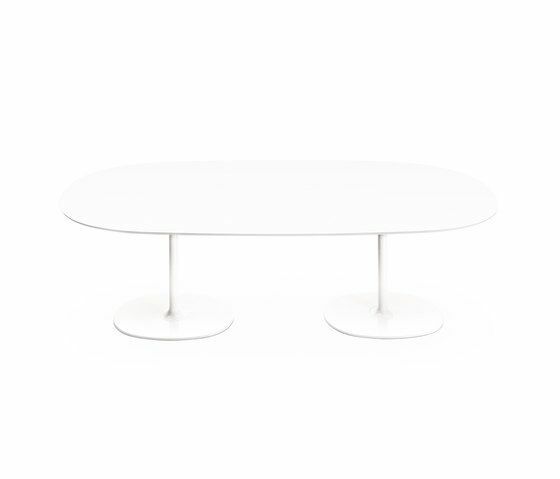 Table with double oval base in chromed or white lacquered steel and oval top in white embossed MDF or lamintae available in different sizes. Height 74 cm. Slender and elegant, Dizzie tables are beautifully suited to the most varied settings and situations: at home, in contract settings, in public and community spaces. Tops in white Mdf come in a range of shapes and sizes: oval, round or square. The base comes in a chromed or white-painted steel finishing and has a distinctive conical shape. The small 51x47cm table comes with a white top and a choice of colours for the painted base. Dizzie is a demonstration of something that may seem obvious but can have unexpectedly pleasing results: a sole change in color or material can radically alter appearance and attitude. With a deceptively simple, visually striking silhouette, Dizzie tables (in 50cm height) take on a sophisticated turn with subtly textured black base and MDF veneered tops in brushed black, brushed white and natural oak. The sensuous, organic shape of the base suggests a drop of mercury. The finely grained, matte surface of the top is a tactile, sensuous cut through that sleek surface. Black base with embossed finish tables in height 50cm are available with wooden tops in brushed black, brushed white and natural oak.